This past season the Green Bay Packers commissioned a study to see how many snaps that UDFA’s played during the Ted Thompson era. The total that they came up with was 77,079 snaps; almost 23,000 more than any other team in the NFL. Over the course of the next few weeks I’ll be breaking down five undrafted free agents that have the best shot of making the Packers this season: LaDarius Gunter, John Crockett, Jermauria Rasco, Matt Rotheram and James Vaughters. If you missed part 1 of the series, featuring LaDarius Gunter, make sure to check it out here. Part two will focus on former North Dakota State running back John Crockett. What we can see here is that Crockett had well above average vertical and broad jump scores, which bodes well for his explosiveness. His 40-yard dash, bench press and 3-cone scores are likely why he ended up being an UDFA and not drafted in the later rounds. Everywhere else he’s pretty much middle of the road. When looking at the tape of Crockett, I came away with a lot of positives. 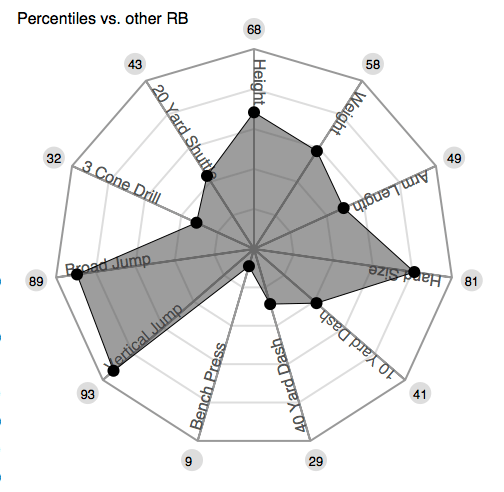 Some of the reasons that Crockett went undrafted were his upright running style, the fact that he didn’t play for a BCS level program, and his lack of top end speed and agility. If you’re looking for him to be a home-run hitting change of pace back, he’s not your guy. What I did find, however, was a player who has the skills to help a team at the NFL level. He can grind a defense with his tough, inside running style and has enough diversity in his game that he can catch the ball out of the backfield as well. He’s got just enough speed to be dangerous if he finds a crease and he could be a bulldozer if he develops in the weight room as a professional; filling out his frame with muscle. Getting a UDFA running back who has good size, can catch the ball and has room to grow sounds like the perfect recipe for a player who will have to work desperately to make an NFL roster. Overall I came away with more positives than negatives on Crockett. Plenty of running backs have succeeded without top end speed and with an upright running style. He hasn’t maxed out his size yet and already shows that he can be a load to take down when he’s running hard. Crockett also has an advantage that almost no other UDFA on the team has; lack of competition. Crockett only has Rajion Neal and Alonzo Harris to beat out for the 3rd running back spot on the team. The Packers are only carrying five running backs into camp, and with Lacy and Starks well established, look for Neal, Harris and Crockett to get a ton of carries in practice as well as in the preseason games. If he takes advantage of his opportunities, he could be the next in a long line of Packers UDFA’s to make an opening day roster. Thank you for reading. Andy Herman is a staff writer for Titletown Sound Off. You can follow him on Twitter @SconnieSports. For even more Packers content, follow us on Twitter and Like us on Facebook. Andy Herman is a staff writer for Titletown Sound Off. You can follow him on Twitter @SconnieSports.